Wireless Network Watcher is a small utility that scans your wireless network and displays the list of all computers and devices that are currently connected to your network. For every computer or device that is connected to your network, the following information is displayed: IP address, MAC address, the company that manufactured the network card, and optionally the computer name. You can also export the connected devices list into html/xml/csv/text file, or copy the list to the clipboard and then paste into Excel or other spreadsheet application. Given this is a portable tool, no installation is required to use it, therefore no changes are made to your PC. 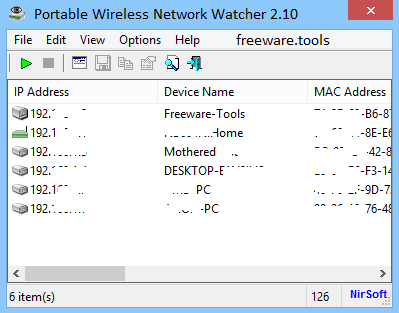 This is the portable version of Wireless Network Watcher - a tool that gives you information regarding the computers connected to your PC via LAN. It can be seamlessly handled, even by users with minimal background in such tools. Since installation is not a requirement, you can save the program files anywhere on the hard disk and access the executable immediately. There's also the possibility of moving Wireless Network Watcher to a USB flash disk or similar storage unit, in order to run it on any computer with minimum effort. An important aspect to mention is that the Windows Registry section does not get entry updates, and leftovers are not kept on the hard disk after removing the program. The app is wrapped in a clean and intuitive window, where a list of all IP addresses in range is automatically shown at startup. You can view device names, MAC addresses, network adapter companies, user text, date and time of the first detection, and detection count. It is possible to copy the MAC addresses or selected items to the Clipboard, use a standard search function when dealing with large amounts of data, generate an HTML report, as well as mark even and odd rows to better perceive data. Other options of Wireless Network Watcher let you change the MAC address format, place a program icon in the system tray area for each accessibility, enable a background scan to carry on with the normal user activity, as well as set the utility to beep whenever a new device appears on the radar. Advanced users have the possibility of establishing an IP address range to scan, use a custom audio file for notifications on new devices, or a command, as well as write the background scan time interval. Wireless Network Watcher barely uses CPU and system memory, so it doesn't put a strain on the computer's overall performance. It has a good response time and works smoothly, without causing any issues. To sum it up, Wireless Network Watcher boasts an impressive range of options for detecting and monitoring IP addresses in your range.